A picture is worth 1,000 numbers? Traditionally, financial statements are represented by columns of numbers. The Company Board ™ business visualiser uses the same information to create a 3-D landscape of business results. This representation highlights the relationships between different concepts making them easy to understand and allows rapid assessment; at a glance you can see, for example, the Debt-to-Equity ratio (that is, the relationship of stacks of red chips to stacks of black chips in the bottom area of the Balance Sheet). A wealth of new understanding is created by having the Income Statement beside the Balance Sheet, using the same scale. These short finance lessons demonstrate the visual learning component of the business simulation and the functionality of the business visualiser. The Income/Outcome simulation board defines the two basic financial statements and the connections between them. Long after the classroom session is finished, employees continue to use this visual as a matrix for organising and expressing ideas. A company manages separately for cash and profit. The Income/Outcome simulation board separates these concepts into two distinct but related flows of activity. Understanding cash flow is one of the most powerful aha! moments achieved by learners. The structure of the Income/Outcome simulation board supports a visual understanding of the use, importance, and inter-relationship of key financial ratios. The Income/Outcome Triangle for Ratio Analysis will be of permanent value to all managers. 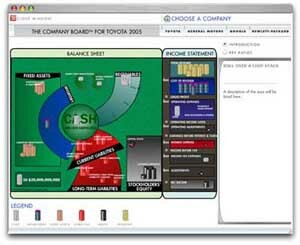 Managers and executives use the Income/Outcome simulation board to visualise the dynamic business scenarios created by strategic opportunity. This visual representation incorporates cost structure and profit, working capital and cash flow, competitor considerations, development time to market, and the overall health of the company. * – “The Company Board” business visualiser is patent pending.